Verint Quality Management can help automate quality assurance while revealing the types of calls that may be the most important. For years, call centers have relied on internally focused metrics to determine the quality of their customer interactions. Now, progressive contact centers and omnichannel customer engagement centers recognize the need to go beyond traditional quality monitoring. They're using “voice of the customer” intelligence captured across multiple channels to help them engage customers more effectively and drive better decisions on products, services, and processes. Verint Quality Management can help your call center, contact center, or customer engagement center evolve from traditional quality monitoring and random call sampling toward insightful, focused quality programs that incorporate the voice of the customer. 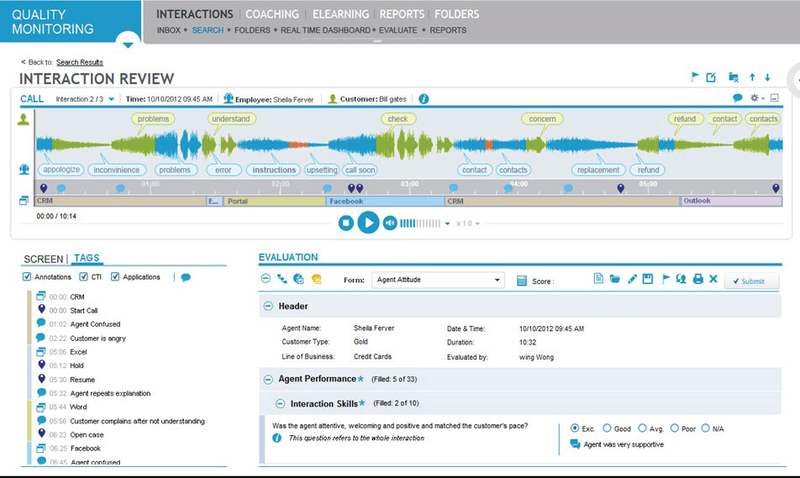 You can evaluate all of the attributes of a customer interaction, including voice conversations and associated screen data, email, Web chat sessions, and more, right from a single screen. With Verint Quality Management, you can easily review interactions and activities conducted on or off the phone, without the need to toggle between multiple screens to complete evaluations. The solution’s intuitive, customizable interface allows you to arrange your workspace to meet your individual needs and preferences. Verint Quality Management can automatically deliver the desired type and number of interactions to be evaluated right to the desktop, based on business rules. If you have multiple evaluators, the solution can provide the necessary workflow among them. It can also help you evaluate an optimum number of interactions across teams and manage quotas effectively. Optional Analytics-Driven Quality functionality can make it easy to search large numbers of calls and focus on the ones that matter the most. Call can be categorized into speech analytics-derived categories focused on situations that can make or break customer relationships, including greetings, escalations, hold behaviors, empathy, and confusion. Powerful search and filtering capabilities can help you find interactions of interest. The solution can even help you pinpoint and navigate to the critical parts of interactions so that you can review them quickly and take action. With Verint Quality Management, you can design flexible, intelligent evaluation forms quickly and tailor them to specific interaction types. Quality scores can feed key performance indicators (KPIs) in scorecards, which in turn can drive performance-based coaching and eLearning. If skill or knowledge gaps are detected during evaluation, the solution can enable you to immediately assign coaching sessions, either manually or automatically, and attach scorecard KPIs, policies, and other relevant information to the sessions.